7. Stand up to those who get some perverse pleasure out of destroying nature (I guess this last one is here as a reaction to the somewhat wanton destruction of trees I've seen recently in the Roxborough section of Philadelphia where I live. As I've looked at the destruction it's been hard to think that there isn't partly just a plain hatred of nature involved). I have to say that I really wanted to title this 'Hydraulic Thrush.' I hope that knowledgeable birders would know what I meant -- the Hermit Thrush. It has a way of raising its tail then lowering ever so slowly, like a pneumatic door closer. That was my plan. We'd seen numerous migrating Hermit Thrush this weekend at both Militia Hill at Fort Washington State Park on Saturday and at Carpenter's Woods in Philadelphia on Sunday. At least two at each place. I took a lot of photos at Militia Hill. I did a preliminary sketch (at top) this afternoon thinking I'd use it to familiarize myself with them before starting a larger watercolor. But I didn't really have that much time today so decided to do a quick watercolor sketch (above) rather than start a new larger watercolor. The rest of the post was then supposed to go on about how interesting Hermit Thrushes were in the way that they slowly lowered their tail. But then reality butted in. 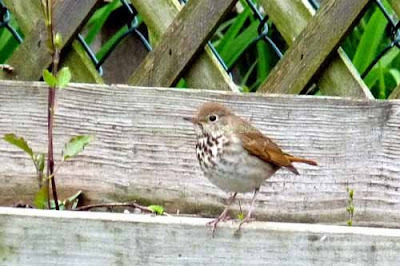 There in our small, urban backyard was our first ever spring Hermit Thrush. In fact he's back again right now and I'll need to cut this post short. 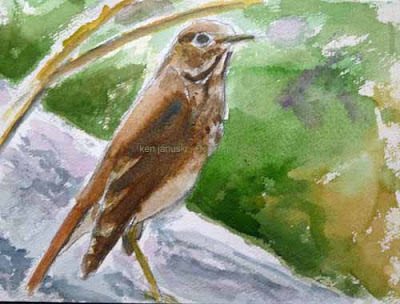 When thrushes come to visit, you shouldn't ignore them. Addendum: the Hermit Thrush stuck around last night. I was busy grilling outside until it got dark and every once in a while I'd inadvertently surprise him and scare him into the next yard. I've been reading both the PA Audubon birding list and ebird for Philadelphia and it's obvious that a lot of Hermit Thrushes have moved through recently. We tend to notice large scale migration when we vacation at places like Cape May, NJ. But it's all the more amazing when you see it right in the city you live in, in the 'normal world' rather the exotic birding vacation world. I think this is one of the most striking aspects of spring: the rhythms of nature on indisputable display. Easter in Philadelphia brought brilliant sunshine, blue skies, wildflowers and migrant birds today, though the temperature never got to 50 in our 3 1/2 hour walk. The cool temperatures didn't make the day seem very promising for birding but we kept discovering new birds, and wildflowers, as we walked along the Wissahickon Creek. 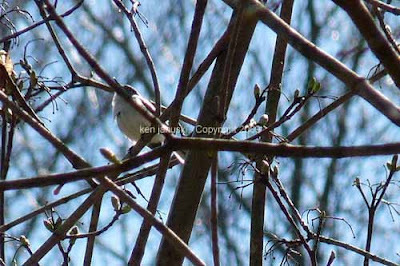 The bird at top is a Blue-Gray Gnatcatcher, the first we've seen in 2009. 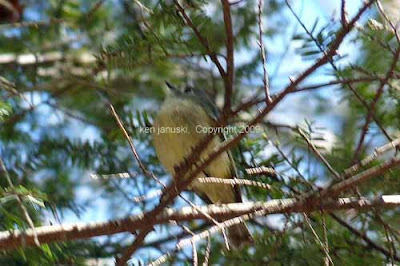 We saw a number of them along with some Ruby-Crowned Kinglets, above, and possibly our first Pine Warbler of the year. 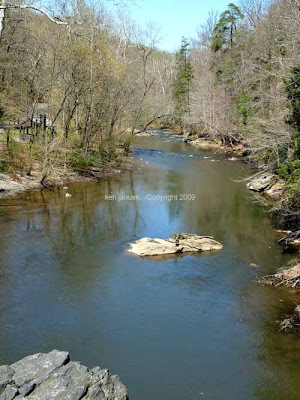 It's always amazing to me to see all that can be found at the Wissahickon. I'm sure Central Park in New York is the same and perhaps other large cities can boast something similar. I'll not try to compare them. But I do love having this natural wonder less than a mile away from our house. 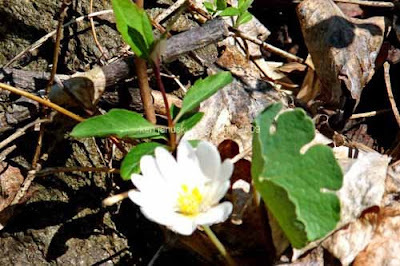 We're always happily surprised to find a variety of wildflowers at the Wissahickon. Today seemed better than usual. 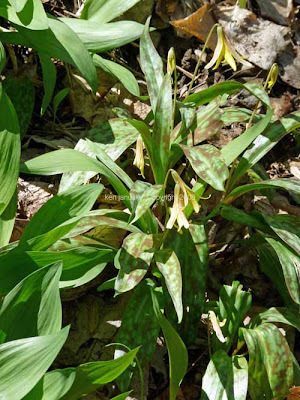 Most Trout Lilies were barely up but a few were fully up and in bloom, as in photo above. 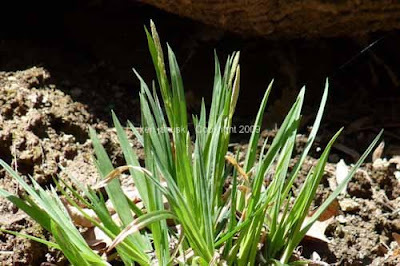 We also came upon a good number of Bloodroots, most not yet in bloom, though a few were. This is the same wildflower as the one whose blossoms were destroyed in our yard by hail about a week ago. We also saw a few Cut-Leaved Toothworts, as in above photo, and a few Large-flowered Bellworts, one of which was just starting to flower. Our own Bellworts are just starting to form flowers now. We should see a lot in a week or two. 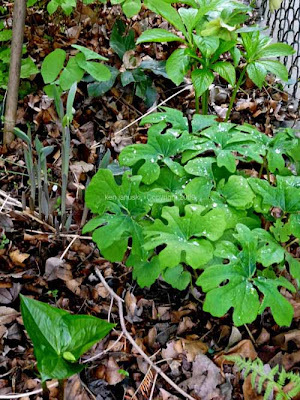 Thousands of Mayapples, as seen above, were just starting to emerge. They won't flower for awhile. Often we see migrating Palm Warblers picking around for food amidst them but we saw just one today, our first one for 2009. No matter how much we know/learn about nature though there are always a few surprises. What is the wildflower above? I had first thought it was wildflower with 'Rattlesnake' in its name. But it's not Rattlesnake Master nor Rattlesnake Plantain. 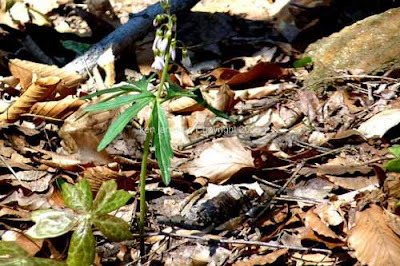 Ah, having checked a second wildflower guide I know why I thought 'rattlesnake.' I was close; the connection is 'poison'. It is Fly Poison, which we often see at Shenandoah National Park but have not seen at the Wissahickon before. Perhaps we'll see the flowers in a week or so. 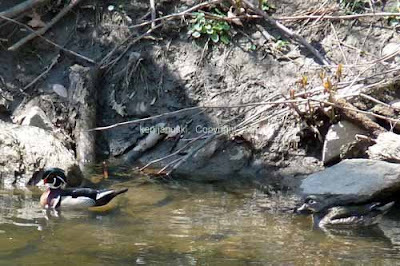 Of course the most beautiful birds of the Wissahickon are Wood Ducks. The ones above were the first we've seen in 2009. Both the male and female are almost too beautiful to seem real. Something else would not have seemed real today, an adult Bald Eagle. 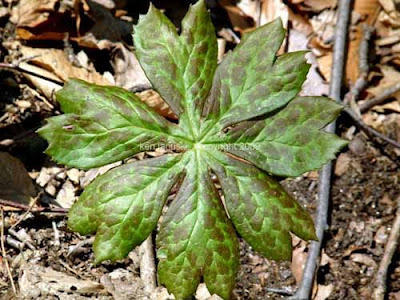 Nonetheless someone did report seeing one on the Wissahickon today. Sad to say we didn't see it. Other notable birds we did see were: Red-Tailed Hawks, Red-Shouldered Hawk, Carolina Wren, many Carolina Chickadees, Hairy and Downy Woodpeckers, and others. I hope to return to artwork soon. As I looked at the Carolina Wren today it was tempting to pull out my sketchbook and see how far I could get before he flew. But today was more of a day for walking, seeing and taking quick photos. I'll return to art soon. The quote is by Evan Charteris in 1927, quoted in the book 'The Watercolors of John Singer Sargent' by Carl Little. It is a stunningly accurate description of watercolor, at least as I do it and, it seems, as Sargent did it. For me watercolor has the immediacy of an emergency. Everything has to be done right, and right now. There are just too many things to be doing all at the same time. Everything seems somewhat urgent. Some people I'm sure spend days on watercolors. But that doesn't seem to have been Sargent's method. Nor mine either. Thus the quote about an emergency. It just hit me over the head as to how truly it reflects my experience with watercolor. I think by the way that Sargent used this phrase approvingly. It added to the challenge. I went back to work on yesterday's emergency today. But it was difficult. Part of the problem is that I let too much white get away. I scraped to try to regain some of it. I also added some darker more vibrant colors. They may have improved it somewhat but I think some of yesterday's spontaneity is gone. I do think it is done. I discovered that its small size just doesn't lend itself to reworking, at least not for me. Time to move on to another one, and another emergency. 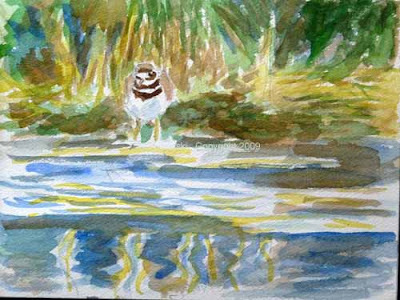 In keeping with my recent vow to try to do watercolors on a daily basis I began this one based on a photo of our first Kildeer of the year, seen at Morris Arboretum about 10 days ago. This is just the beginning stages of it. I also received a book on the watercolors of John Singer Sargent this morning and I can see that it might have had some influence. I've avoided Sargent in the past because he just seemed too facile, too much the showoff. But this book, which I've spent all of 15 minutes on, shows him to be an extremely talented watercolorist. 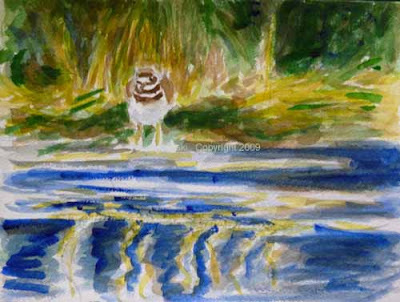 More on him and this kildeer watercolor in days to come. 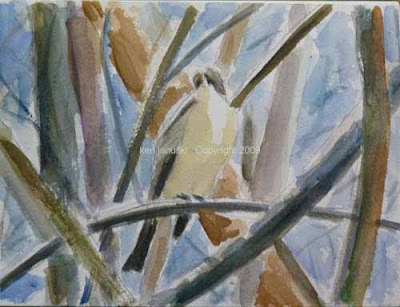 It was about ten days ago that we saw our first Eastern Phoebe of the spring. This was at Morris Arboretum in Philadelphia on the same day that we saw our first Kildeer, whose quick portrait topped the next to last post. This watercolor, based on a photo from that day, was a quick one that I did this morning. It took 60 minutes at most. More than anything else I think it's an attempt to exorcise the darkness of the last watercolor ('Solomon's Seal, Meadow Rue, Birdbath'). It's also an attempt to start seeing and saving more lights in the painting, no matter what I actually saw. This Phoebe was buried in saplings, backed by a gray, overcast sky. Gray on gray. So I attempted to add a little color and some tonal contrast here. It's also just for practice. I love watercolor but am not yet all that comfortable with it. But a watercolor a day (more or less) may help improve that. Today, beautiful as it was, was a day for work. So after transplanting many tomato seedlings, then tilling six raised beds to get ready for planting, I felt I deserved an art break. Though just about everything in the yard calls out for being painted right now I decided to try the newly visible Solomon's Seal and Meadow Rue, along with the handmade birdbath that is next to them. I'm always impressed by the beauty of the Solomon's Seal as their red stems break the soil. About the same time they come up a number of Thalictrum, or Meadow Rue, do as well. They inhabit a dark, shady part of our yard next to an ancient bird bath I made from poured concrete years ago. This seemed like the perfect opportunity to work from life, not from a photo. I'm sure I could have gotten a really striking photo but I wanted to work directly. Unfortunately I chose to work in watercolor pencils and waterbrush. I'm still learning how to handle these and the results weren't that happy. Finally I brought the whole thing inside and went back to work with real watercolor and brushes. The result is DARK. The scene itself was dark but I think that the first thing most people need to do with watercolor is decide where the light areas will be and be sure to keep them. I find this particularly hard to do with watercolor pencils. 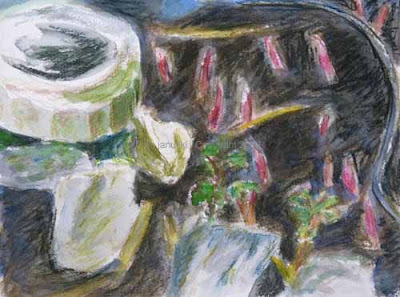 Though my guess is that I'd also have had trouble with plain watercolors if I'd used them because there wasn't much light, outside of part of the birdbath and some of the stones. So that's something I continue to need to work on: see the lights and darks, and make up some lights if I don't see them! Obviously I could also use some work in learning to portray stones in watercolor. In the end I tried to use mainly dark colors to unite this small watercolor. I don't think it's all that successful but sometimes you just need to start working and make the best of the results. If you're not happy remember what you learned for the next one. Either way, artistic success, failure, or somewhere in between, it was great to be able to be outside again, especially to start working from life outside. It's been over 13 months since I started this blog and I wanted to write a short anniversary note. I wasn't really sure what I was going to do here. 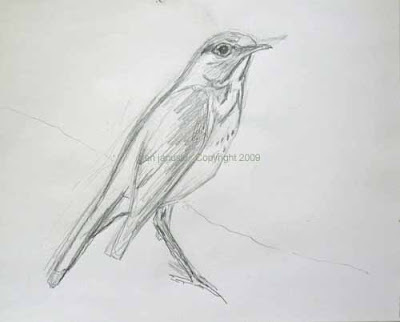 I hoped to use it to show new sketches, perhaps more developed drawings and paintings, and write about my birding and other nature-oriented activities. In some ways it's been wildly successful: I think it's really been an impetus for me to do more artwork. I can't argue with that. The more time I spend on art the better. Writing about birding and nature has not been as successful. But that's really because I've learned that though I am interested in them there are very many other bloggers writing similar blogs and my observations aren't really anything special. So I started off writing more about birds and nature but slowly I changed to writing more about art, especially art that has birds or nature as it's subject. That seems to me to have been a pretty organic evolution. 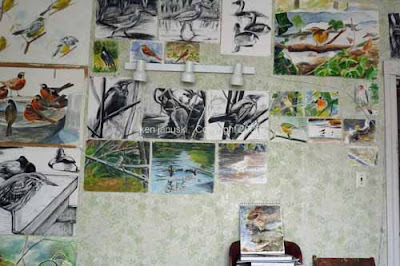 I'm sure readers might sometimes wonder just what kind of hodgepodge blog I have: sometimes it's about birding, sometimes about art, sometimes something else. Well every blog has a right to be just what it wants and hope that it finds an audience. I think along those lines. But I also think that it's grown into a blog with a fairly predictable subject: art about nature, especially my own art. Another huge aspect of blogging though is the people I've met visiting their blogs, and sometimes welcoming them as visitors here. I was a skeptic about blogs for many years. Who would be interested in someone's personal writings, especially a few, million 'someones'? Well I found that I became quite attached to certain blogs and get a great deal of pleasure from reading them. I also feel that I've become part of a community. I'm not going to name any particular blogs here but blogs where I comment frequently will know that they are among them. As I said this has been one of the most pleasant surprises of the blogosphere. Finally there's something I've kept out of this blog: art theory. As readers of other blogs know I can sometimes expound at length about art theory. This is a dangerous tendency and I've often felt that I ought to expound here if I'm going to go on at such length. But I don't. I may mention it once in awhile but I don't go at length about contemporary art history and theory as I have on other blogs. I think it would be too disjointed if I were to do so here. And I think it takes away from my main goal: to create art. So art theory is something that I'll continue to avoid here and probably on other blogs as well. Art theory is fine but I think for most artists they should really convince themselves that they don't have time for it. It can be enervating rather than inspirational. Enough said on that! So Happy Anniversary to this blog and to all its readers!